On-seed application of peat slurry has provided the best nodulation, grain yield and nitrogen fixation in experiments comparing different methods of inoculating legumes. The research, conducted by Waite scientists with Grains Research and Development Corporation (GRDC) funding, concluded that on-seed inoculation was “consistently superior” to in-furrow inoculation in terms of nodulation and crop productivity. Eight field experiments were conducted over two years at four different locations in south-eastern Australia to quantify the response of lupin and faba bean to three inoculant methods: on-seed application as a peat slurry; in-furrow peat inoculant delivered as a liquid suspension at seeding; and in-furrow peat granules delivered at seeding. Uninoculated treatments were also included in the experiments which were located at Mininera, Rutherglen and Boorhaman North in Victoria, and Culcairn in New South Wales. 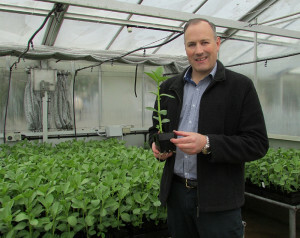 Research leader Matt Denton (pictured), from The School of Agriculture, Food and Wine, The University of Adelaide, said the aim of the study was to determine whether inoculation application methodologies altered the patterns of nodulation on roots, and if so, whether this influenced nitrogen (N) fixation, crop growth or grain yield. “The experiments were conducted to test the hypothesis that granular and liquid inoculants increase nodulation on lateral roots, with subsequent positive impacts on legume productivity,” Dr Denton said. For further details, see https://grdc.com.au/news-and-media/news-and-media-releases/south/2017/08/legume-inoculant-comparison-on-seed-trumps-in-furrow.